An awful movie, extremely well done. Subtitle would be “a defense of assisted suicide.” From start to finish, it’s a set-up, preparing us for the most antiseptic horrible ending you could imagine. Handsome young daredevil hedonist hit by motorcycle in rush-hour London traffic had everything, lost it in a minute except for his and his parents’ enormous wealth, including ownership of a huge castle on a huge park-size estate. Here he suffers in style but suffers nonetheless, but here he also finds joy and happiness which distracts him from his plans to end it all, thanks to a young local who, desperate for work, takes the job of his non-medical professional companion. She’s a natural, a true diamond in the rough, wholesome, cute, lively, full of love and kindness for her fellow man. The actors deliver in a skillful production, and we the viewers are gripped by the (melo)drama of it all as she gets through his defenses and by charm and intelligence and sheer brightness and lovingness of personality and character gives him a new lease on life. But a lease is not a sale, and he succumbs in the end to his wish to be relieved of life itself, immensely grateful for the respite she provided and having set her up financially and psychologically for a better life than she could have had or would have dreamed of having, while he drifted off to nothingness. It’s a fairy tale with a new ending. They all died unhappily ever after. Oh my, I recommend the Free Beacon but did not mean to paste its whole front page here. Another bad use of an Opera extension. Sorry. Not in so many words, but what are we to make of this, from his apostolic exhortation In March of last year, Amoris Laetitia? cause that is not the logic of the Gospel! I had a column several decades past in National Catholic Reporter in which I (satirically) said Vatican Council 2 must have abolished mortal sin, because everyone was going to communion at mass, whereas before the council many held back, not having gone to confession. I mentioned it to a Jesuit friend a few months ago, assuming he knew I had been attempting satire, and he erupted in a responding email message, among other things saying he “could go to hell” himself. It was a stunning reply in view of his clearly upright, indeed distinguished long life as a Jesuit, but he was deadly serious. As for what Francis said about it as quoted above, it is unsurprisingly among “key doctrinal errors” from Amoris, cited by Matthew McCusker, Deputy International Director of the Society for the Protection of Unborn Children, speaking at the Rome Life Forum on 6 May 2016. The above statement follows this from the same document, “The way of the Church is not to condemn anyone forever.”. very difficult to make sense of these statements, because . . . it is precisely in the gospels that Our Lord Himself speaks many times about the possibility of men and women being condemned forever as a result of sin; “depart from me you cursed into the everlasting fire” he represents himself as saying on the day of judgment, “and these shall go into everlasting punishment: but the just, into life everlasting.” (Mt 25:41, 46). And, the Church, while always desiring and working for the conversion of sinners, nonetheless will refuse the sacraments indefinitely to those who fail to repent of grave sin. It’s confusing, to say the least. Indeed four cardinals sent “dubia” (doubts) about this and other parts of Amoris to Francis, asking to meet with him — in the spirit of Paul “withstanding Peter to his face” in the matter of enforcing Jewish dietary and other laws on Gentile Christians — but Francis has not met with them and has not responded to their questions. Lo the poor Democrat, wond’rin’, wond’rin’, wond’rin’ . 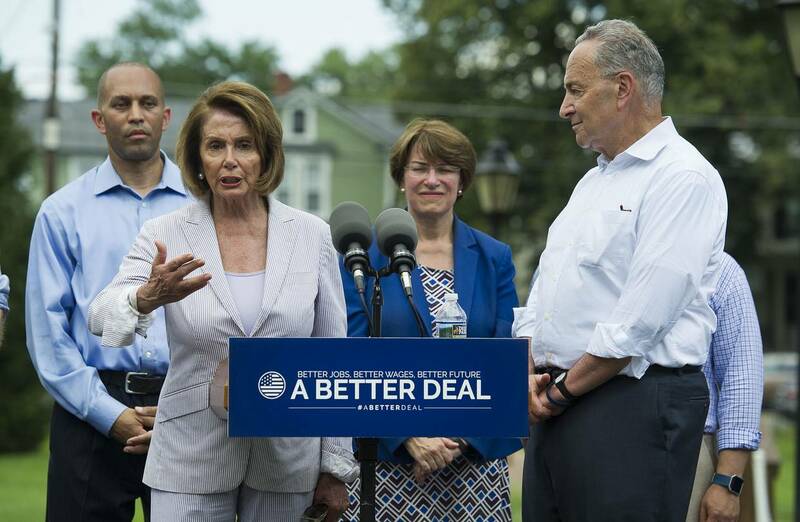 . .
On climate change, Democrats believe they know to the 10th decimal place that Earth is on the brink of an apocalypse. But by their own admission this week, they don’t have a clue about which way the wind is blowing with the American voter. Not for lack of trying, mind you . . .
Why did we lose, why did we ever lose???? And now he is the ruler — not of the queen’s nigh-vee — but of the Amazon Washington Post! Just over two decades ago, Jeff Bezos started selling books online from his garage. Today, the Amazon CEO is the richest person on Earth. Bezos’ net worth topped $90 billion on Thursday, allowing the Amazon founder and CEO to narrowly dethrone Microsoft co-founder Bill Gates as the richest person in the world, according to Forbes and Bloomberg. If Amazon stock holds steady through trading Thursday, Bezos will officially bump Gates, who has been No. 1 since 2013, from the the Bloomberg Billionaires Index. You too can be a Bezos, thanks to at least partially unfettered CAPITALISM! Academics are bringing it on themselves, argues an academic. As an academic, I am increasingly convinced that a mass defunding of public higher education is coming to an unprecedented degree and at an unprecedented scale. People enjoy telling me that this has already occurred — that state support of our public universities has already declined precipitously. But things can always get worse, much worse. And given the endless controversies on college campuses in which conservative speakers get shut out and conservative students feel silenced, the public relations work is being done for the enemies of public education by those within the institutions themselves. Who’s to blame for the fact that so few Republicans see the value in universities? The conservative media must accept some responsibility for encouraging its audiences to doubt expertise; so must those in the mainstream media who amplify every leftist kerfuffle on campus and make it seem as though trigger warnings are now at the center of college life. Etc. etc. Thoughtful piece. Read on . . .
“Better tell that mayor to get tough,” Trump had said. And it’s working! Why can’t Trump see that? Emanuel said he is working to create jobs, expand after school programs and curtail access to guns as part of a comprehensive strategy that includes an increasing reliance on high-tech crime fighting tools, like the Shotspotter program that uses high-powered microphones to detect gunshots. Fine, for the last named, which is crime-fighting. The others are social services. Why always the preference for social service? Brought here thanks to Steve Bartin’s News Alert. Includes head of Alinsky foundation and David Alinsky, Saul’s son. Dinesh d’Sousa supplying a probably counter argument, James O’Keefe moderating. Have only just set it up for viewing. Looks good. Instapundit » Blog Archive » NONPARTISAN PROFESSIONALISM IS A MYTH. . . .
Big mistake here, using an add-on that gives strange results. Sorry. Thereby pretty much destroying the concepts.